BVV Barendrecht is an amateur football club from the town of the same name, which has become a suburb on the west of Rotterdam in the state of South Holland. The club was formed on the 12th February 1926. 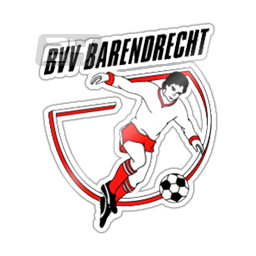 Barendrechtse Voetbalvereniging Barendrecht, to give the club their full title, initially began life as DETO, playing at Middeldijk on land owned by farmer Jan Leeuwenburg. In the early years the team didn’t belong to a league, but played friendly games, with a win over a combined team of Feyenoord, Overmass and DCL players being a notable achievement. The club became Barendrecht for the 1930-31 season, with the club joining the Rotterdam Football Association (RVB) and joining the Zondag Derde klasse (third division Sunday football). The first official game ended in a 5 -1 victory over APM-Rotterdam Delfshaven. The team won the championship with ease to secure promotion to the Tweede klasse. The team continued to prosper winning a second promotion to the first Eerste klasse in 1932-33, with a thousand fans attending a game at Middeldijk, with patrons having to reach the pitch by crossing the ditch on a narrow plank. Remarkably no injuries or accidents were reported! During the 1933-34 campaign a fight ensued during a match, leading to the referee being struck. As a penalty the KNVB suspended all club members were given a suspension from the game for one year. This hit the club hard as they suffered relegation, before regaining their first class status in 1938. After the end of the War the club applied to the council for a new ground, but were turned down. The team rebuilt and gradually reached the top league of the RVB, this time as a Saturday side from 1952. Top players of the time were Dries Gouw, Cees van der Velden and Henk van Vugt. The club moved to play games at the Acterzeedijk following their success. The ground called Op Onrust was by the Oode Mass and flooded easily. After just two years Barendrecht were on the move again, this time to Lekstraat before heading to Sportpark Ziedewij on Stationswijk. A victorious 1960-61 season saw Barendrecht win the RVB title and clinch promotion to the KNVB leagues following a 4-1 win against ZWSH in front of 1,200 fans. In 1969 another title arrived at the club as they reached Tweede klasse, which was the highest level of Saturday amateur football. A new board brought ambition in 1973 with the former Feyenoord player Daan den Bleijker arriving as head coach. Another league title arrived in 1975, before the club moved to the well appointed Sportpark De Bongerd in 1976, which offered five playing pitches. The move brought further success. The team were promoted to Eeerste klasse as they went unbeaten, culminating in a 5-0 victory to reach the Hoofdklasse, highest level of Saturday amateur football. The club regularly attracted top teams for friendly games. In 1983 a Feyenoord side containing Ruud Gullit and Johan Cruyff drew 3-3 at De Bongerd. The club put its efforts into developing their youth structure, while competing with some professional clubs at senior level. The first team came close to titles before coach Ronald Klinkenberg put a team with a mixture of youth and experience together for the 1997-98 season. The result saw Barendrecht being crowned as Hoofdklasse B champions as Pieter Vermaas ended the campaign as top scorer. The team went forward to the play offs to decide the national amateur Saturday champions, where IJsselmeervogels came out on top. 2009 saw De Rood-Witten (the red and white’s) collect the KNVB Amateur Beker following a 3-1 victory over LRC Leerdam The following season saw the former player, then coach Jack van den Berg lead the side to the Hoofdklasse A title and promotion to the newly formed Topklasse. Once again IJsselmeervogels proved too strong in the championship deciders. The 2011-12 campaign saw Barendrecht finish close to the relegation spots before finishing as runners-up the following season. The team ended in fourth position in the 2014-15 season under coach Adrie Poldervaart. BVV Barendrecht will play in the Zaterdag Topklasse in the 2015-16 season. My Dutch adventure was going well on its fourth and final day. I had finished my fun around Rotterdam and it was time to head east. My evening match was in Tilburg between Willem II and Heracles Almelo, but on route I had deducted that I could visit another senior non-league club. The train pulled in at Barandrecht. My immediate impression was that it was a town of light industry with new housing. After a couple of false starts I was on my way through the houses and alongside the many small canals before emerging at the Sportpark De Bongerd, with its many grass and artificial pitches. The main stadium was locked, but that wouldn’t stop me having a good look around and getting some photos from various vantage points. A large brick clubhouse stood guard by the turnstile. The artificial pitch was surrounded by hard standing and then a small grass bank on three sides. Raised advertising boards backing onto the hedges and rear fences gave the arena an enclosed feel. The far side had a TV gantry on the half way line. The final fourth side had a fine raised seated stand as well as all the other facilities. It was a fine and neat venue. Once I’d walked all the way around it was time to retrace my path to the station. Initially I’d intended to head back to Rotterdam to take a fast train to Tilburg, but as luck would have it, a rapid service was approaching to Breda. I jumped on board and changed at Dordrecht for my destination.